Just wanted to pop in to tell you about several specials going on right now with Close to My Heart. 2. Make it a Banner Day! 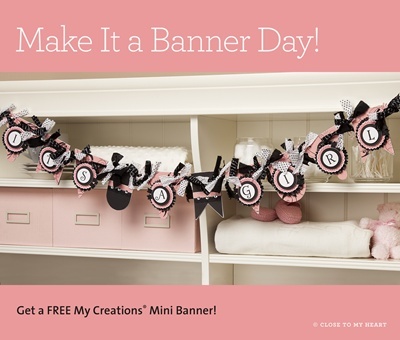 For every $25 purchased that includes a qualifying stamp set, you will receive a free mini banner. The mini banner includes 10 chipboard pennants in 4 different shapes with 9 jump rings for hanging. Available through June 30, 2013. 3. Let's Get Patriotic! 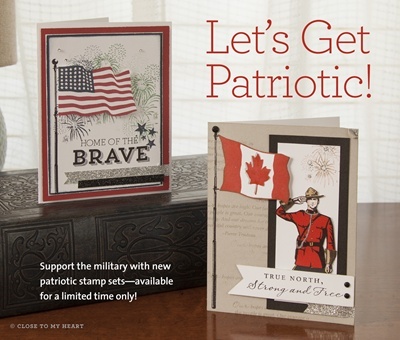 Celebrate military service and promote patriotism with our new patriotic stamp sets—available only from June 1 to July 31, 2013. Three dollars from each B-size My Acrylix®Courage stamp set and $5 from each D-size My Acrylix® Home of the Brave stamp set will be donated to the USO, the leading, most recognized military-support and services organization in the country. Show your support with your own patriotic stamp set! And don't forget the June Stamp of the Month just $5 when you spend $50. This month's is A Flowering Bunch, set of 10 stamps. You can see it on my CTMH Website where you can place your order and take advantage of any or all of these specials. Or, feel free to send me an email (click on contact me on the right) where I can give you a discount on your order!